On Wedding Wednesday, I decided to host a Twitter chat. It was super successful and we'll be doing it every Wednesday at 4pm EST. Just use the hashtag #BridalBabble to join. During this week's inaugural chat, Becka shared her homemade save the date cards with us. She went to her local craft store to purchase iron on letters and t-shirts, then made the shirts herself. She got a friend to go with her (to a gorgeous location) to take the photo. To finish, she added the text (you can use a site like PicMonkey to do this for free if you don't have Photoshop). Becka printed the photo at her local Walmart. There are also sites where you can get free photos (like Shutterfly and York Photo when you register as a new user). You do have to pay shipping on your free photos, but it might average to be less than actually paying for the photos, depending on where you print. She picked up a box of envelopes and was ready to send them. The average cost of a save the date is about $3 (not factoring the cost of a photo shoot with a professional), so this is a way to bring that cost down a lot. Plus, save the dates are really customary now. People expect you to send them now since everyone does, so it is another thing to add to the list of expenses. If you can at least make them on a budget and keep that cost to a minimum, you're in good shape. 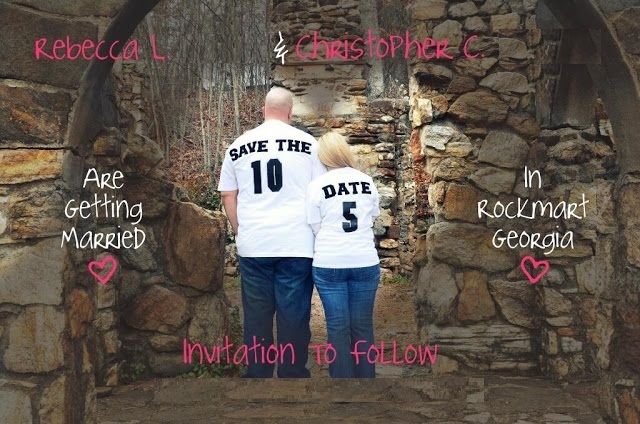 BRIDAL BABBLE: Did you send save the dates? Oh My Gosh! You might have just given me the BEST idea ever! !